Reverse osmosis (RO) is a means of purifying water, and it is so successful that it is how we desalinate our drinking water. In gardening, reverse osmosis is the means of filtering water to eliminate any harmful particles to ensure the water used for irrigation is pure. This is done through a filter, and requires you to then treat the water with Cal-Mag supplements, as to not shock the plants pH level. You may also need a pH adjuster kit and a pH meter. It is especially important for gardeners growing hydroponically to ensure they are filtering their water with a RO water filter. Reverse osmosis water filtration is the number one method of purifying water for plant use. In a hydroponic system, it is very important we make sure our plants are getting the best water possible. The first step in purifying water through a RO filter is allowing it to pass through a sediment filter, which will eliminate large particles, and then through a semi-permeable membrane to do the same with minuscule particles. While it cannot prevent gasses from passing through, an RO system usually does a good job of cleaning gas from the final product. Is RO water ok for plants? Not only can you use RO water in your hydroponic system, it is actually the best option available! Plants will absorb anything present in the water they are given. This includes nutrients, but can also contain the harmful particles found in local tap water. In some cases, this will lead to problems with the root, a slow in growth, or toxicity to the plant. A more serious issue is when the contaminants absorbed by plants are then passed onto the humans that consume them. RO filters can remove over 95% of dissolved solids from contaminated tap water. Knowing what is in your local water is important, but more often than not, you cannot go wrong with an RO system. What is the best reverse osmosis water filter? 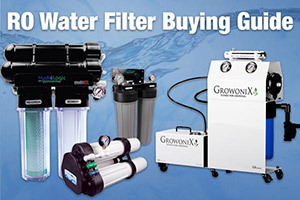 When choosing a water filter, first determine the water needs of your hydroponic system. How many gallons will you need to filter on a daily basis? This is known as the GPD (gallons per day) measure of your RO filter. 100-200 GPD is probably plenty for small indoor hydroponic gardens, but large commercial greenhouses will need to filter up to 2,000 GPD! At Hydrobuilder, we have RO filters for every size hydroponic system. The Active Aqua 50 GPD Two-Stage Reverse Osmosis System is a great RO filter for hobby growers, and can filter up to 50 gallons per day. For larger commercial hydroponic operations, the Hydro Logic Evolution-RO1000 High Flow RO System, 1000 GPD is a great choice, filtering up to 1,000 gallons a day! Regardless of which RO filter you choose, you will eventually need to replace the RO membrane. At this point, you can upgrade to a membrane capable of filtering more gallons per day if necessary. If you want to learn more about choosing the best RO filter, check out our water filter buying guide in our learning center! One of the main benefits of stripping your water of all minerals and additives is that you are in complete control. By starting with pure water, you as the grower have the ability to precisely dose nutrients in PPM for your plants! This is an important realization, because not adjusting the nutrient solution for RO filtration can lead to deficiencies in minerals and micronutrients for the plant. If you are unsure which RO filter is right for you, give us a call at 888-815-9763 and our experienced growers will help you pick the best one! If you are interested in learning more about the art of hydroponics, check out our learning center!